Misidentified 2C-B-fly has contributed to at least two deaths and several hospitalizations in early October 2009. Because of the immediate nature of this issue, please be sure to pass this information to anyone who may come into contact with 2C-B-fly. One confirmed death occurred in Denmark, another in San Jose, California. Both followed the use of material sold as 2C-B-fly, acquired from the research chemical reseller Haupt-RC, but manufactured in China. Both deaths and some hospitalizations were reportedly caused by a batch identified as "b1" on the label. Another U.S. death related to material purchased from a different reseller has been reported but not yet confirmed. It is possible that resellers of misidentified 2C-B-fly are sourcing from the same manufacturer. 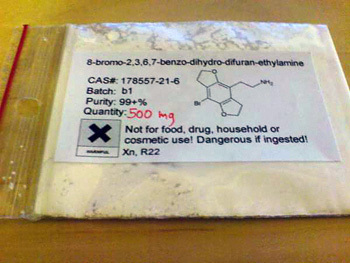 Based on details about the confirmed deaths and hospitalizations, especially dosage and duration, it was speculated that this material may be bromo-dragonfly, which is rough ten times more potent and has a longer duration. Laboratory analysis conducted by Energy Control in Spain found bromo-dragonfly with unspecified synthesis impurities (see below). An Erowid Center-sponsored analysis conducted in the U.S. also verified the material was bromo-dragonfly. "He had multiple major health problems, including a serious stomach ailment, heart murmur, chronic vomiting and really bad headaches/migraines (probably stress related), many ulcers, a connective tissue disease that can affect internal organs (he also had stopped taking his medication for this), and probable severe liver and possible kidney damage from a suicide attempt with Tylenol and Alleve, and he also may have had additional damage for those and or other organs from using what now appears to have been large amounts of recreational drugs and from whatever taints and cuts were present in them." Brian began having a difficult trip at two hours after ingestion. At three and a half hours after ingestion he began having what appeared to be seizures but could have been strokes or a heart attack, or a combination of those. 911 was called and CPR was performed. He died approximately four hours after ingestion. John, who had taken 10 mg, experienced "intense gastrointestinal disturbances" and was still experiencing effects at 30 hours after ingestion. He and Lindsey both reported extremely strong experiences and were both taken to the hospital in restraints after the paramedics/police arrived. The material was ordered from Haupt-RC on September 29th and was received on October 3rd. It has confirmed been that the material's label included "b1" on it. This information has been provided to Erowid by another brother who was present during the event. John's girlfriend Lindsey submitted an experience report describing the incident. A 23-year-old man admitted himself to the hospital on October 10, following increasingly strong effects from material ordered from Haupt-RC (material's packaging matched the one pictured above). Experience report describing the incident. On Friday Oct 9, the Spanish harm reduction group Energy Control received a "2C-B-fly" sample, which they analyzed using thin layer chromatography (TLC). 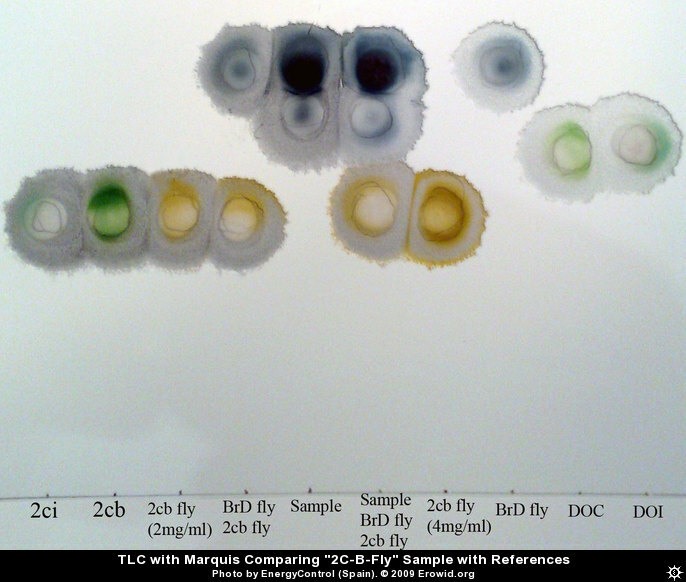 A photo on the right (click for full size) shows the test TLC plate for the sample and several reference chemicals, singly and mixed, with Marquis reagent coloring. The results suggested that the Haupt-RC sample ("Sample" in the image) could be bromo-dragonfly with another substance. Analysis of the sample via GC/MS confirmed the TLC results and strongly indicated bromo-dragonfly along with several synthesis impurities. (click image below, right for full size). The sample, a "really thin" powder, came from someone in Spain who had acquired "2C-B-fly" from Haupt-RC (the product label included "b1" on it). After hearing about the Danish death related to this material, he preferred to wait for it to be analyzed by Energy Control before ingesting it. 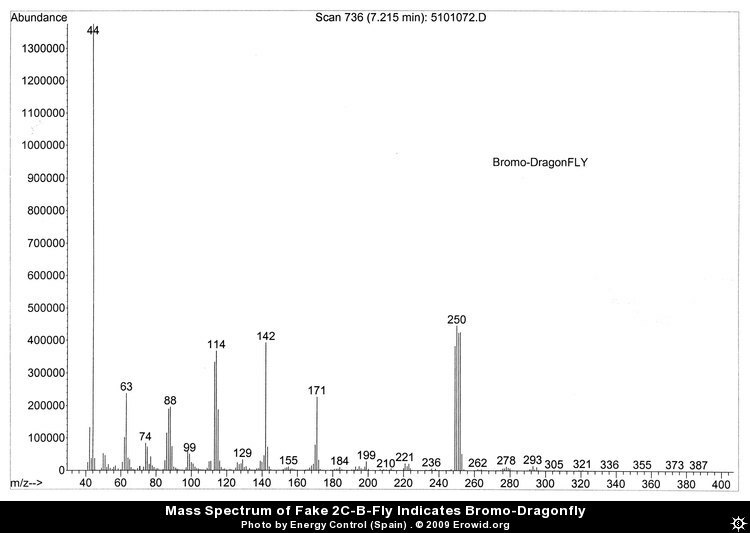 A sample of "b1" Haupt Research material represented as 2C-B-fly was tested by Drug Detection Laboratories via GC/MS on Oct 15, 2009 on behalf of Erowid Center. This material was Bromo-dragonfly, confirming the Energy Control results. People who choose to use 2C-B-fly, or any research chemical, should be extremely careful and should have a sober sitter present. Please read the Research Chemical FAQ and be aware of the risks you are taking. If you have experienced any side effects, health complications, or lasting effects from 2C-B-fly use, please submit them to our Experience Vaults (while it is not required, including your email address permits Erowid to contact you privately with follow-up questions). If you have personal, verifiable knowledge of a related death or hospitalization, please consider emailing sage at erowid.org with details. v1.0 - Oct 10, 2009 - Erowid - Brief placeholder warning, pending additional details. v1.1 - Oct 10, 2009 - Erowid - Added a few details about California death (dose, location). v1.2 - Oct 11, 2009 - Erowid - Correction to date material was ordered, added link to Lindsey's report. v1.3 - Oct 12, 2009 - Erowid - Added link to report of hospitalization. v1.4 - Oct 14, 2009 - Erowid - Added "Material Tested in Spain" section, added line about an additional (unconfirmed) death. v1.5 - Oct 15, 2009 - Erowid - Added image of Energy Control's GC/MS output and link to Energy Control alert. v1.6 - Nov 9, 2009 - Erowid - Added Drug Detection Laboratories analysis result.